An investor can double their money by investing in various financial products. A majority of financial products takes 3-6 years for doubling the money. However, in the stock market, you can double your money in less than a year. Don’t get surprised, today I will be sharing information about 15 stocks that have given more than 100% return in last one year. Rajesh Export has given 239% return in past one year. Rajesh Export stock was trading at 170 Rs at the beginning of the year and today it is trading at 577 Rs. The major reason behind an increase in the stock price is an increase in profit margin and good order book. Gayatri Projects is the infrastructure company. Gayatri Projects has given 286% return in past one year. Strong fundamental and growing order book is prime reason of the increase in stock price of Gayatri Projects. Welspun india is next in the list. Welspun India is the biggest manufacture of the towel and other textile products. Welspun India was able to generate 165% return in last one year. Chennai Petroleum is state owned oil and gas company. Last year performance of Chennai Petroleum was very good. This stock was able to generate return of 159% in last one year. Godfrey Philips is leading cigarette manufacturer of India. 2015-16 was very good year for the Godfrey Phillips. A stock was able to generate 152% return in last one year. Jubilant Life is Pharma sector company. Jubilant life has a good customer base in domestic and in the international market. Revenue and profit margin of Jubilant life are increasing gradually. Jubilant Life was able to generate a return of 126% in last one year. Himatsingka Seide is integrated textile design and manufacturing company. Himatsingka Seide has spread across Asia, Europe and North America. Financial performance of this company is very good. Profit margin and revenue are on growth path. Himatsingka Seide was able to generate a return of 125% in last one year. Dishman Pharma is specialized in the manufacturing of ingredients in pharma industry. Dishman has shown a very good boost in last year. This stock was able to generate 120% return in last one year. Trident is textile company specialized in manufacturing of towel. Trident is one of the largest manufacturer and exporter or textile items. 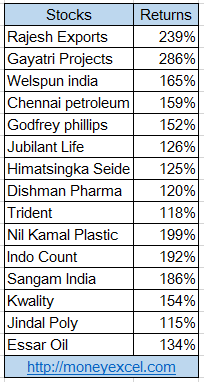 Trident is able to generate 118% return in last one year. Nil Kamal Plastic is next in the list. Nilkamal Plastic was able to generate nearly 200% return to the investor in last one year. The increase in profit margin and reduction in production cost is the main reason behind upside in the stock. Indo Count textile manufacturing company is constantly making good profit. Indo count has given 192% return in last one year. Sangam India is next in the list. Sangam India is a textile company. Sangam India was able to generate return up to 186% in last one year. Kwality is food processing company. Kwality is also in the race of doubling investor money in last one year. Kwality has generated magnificent return of 154% in last one year. Jindal Poly is in the polyester and packaging business. Jindal Poly was able to generate 115% return in last one year. Essar Oil is last in the list of stock that doubles investor money in last year. Essar Oil could able to generate 134% return last year. 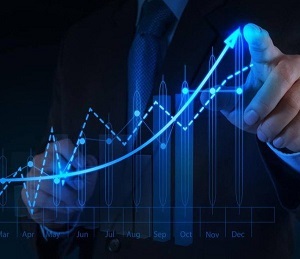 Although stocks mentioned above were able to double investor money in last one year, it is not guaranteed that these stock will generate a positive return in the future. An Investor should invest their money in the blue chip stocks with good fundamental and future growth. If you are planning to invest your money for 3-5 years you can plan to invest in Bjaja Auto, Hero Motocorp, Cadilla Health care, Torrent Pharama, Piramal Enterprise, Eicher Motors or Bajaj Holdings. These stocks may not double your money in one year but these stock will defiantly generate very good returns for the investors in future.